Myrhiadh clutched the iron bars of her prison cell tightly, and the chains binding her slender wrists clanked hollowly against them. She shook the door violently, succeeding only in adding to the ringing sound of metal that reverberated through the dungeon, stinging her ears. Flinching at the sound, she waited until the resonance died away, and then screamed—a primal scream of rage and betrayal. Her voice echoed down the stone dungeon corridor. No answer. The echo mocked her. Silence. Myrhiadh bit her lip sharply, and then flung herself away from the bars and paced her narrow cell, her face drawn with fury and frustration. A stream of light from a small, barred window high above her head teased her, casting a beam of gold across the cell and then whipping it away as a cloud passed over the sun, plunging the prison into gray. She pounded her bound fists into the stone wall but only succeeded in bruising her knuckles. She knew. She knew how she had ended up in this place. He had lied to her. Every word out of his mouth had been a lie, the whole time he had praised and teased and promised, and it had all started at that archery competition a month ago. Only a month…? “Down to two finalists, then!” the judge cried loudly. The floppy brim of her light brown hat shaded Myrhiadh's eyes from the glaring sun as her gaze swept over the crowd in the canopied stands. Everyone who had attended today was arrayed in somber browns and grays, but wore festive faces, enjoying the competition. Archery contests in Grymwalde, the capital city of Zandor, always drew large crowds. Even royalty had turned out today, although they sat on the opposite side of the field from everyone else, in their private booth. Myrhiadh squinted. She could see what was probably the king himself, seated in the grand chair front and center, flanked by two young women in dark robes, who were likely the princesses. The Praeceptor was definitely in attendance—she could tell him from the others by the overwhelming size of him. He dwarfed the man sitting beside him, who might be a duke or something similar, judging by the cut of his coat and his broad-brimmed black hat. Being a finalist before royalty was undoubtedly an honor. A nerve-wracking honor, but pleasing, nonetheless. Myrhiadh wiped her clammy hands on her breeches. 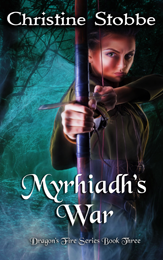 Myrhiadh’s focus drew to her competition, a young man slightly older than she, as he positioned himself on the hundred-yard line before the target and raised his bow. Myrhiadh adjusted her hat brim carefully, hoping that none of her long hair had spilled from beneath it over the course of the afternoon. Gregory let his arrow fly, straight and true, at the target, and struck the gold ring in the center. The crowd cheered. Myrhiadh stepped forward, acknowledging the judge with a curt nod. She raised her bow, sighted the target, and released her arrow. A direct hit. More cheering. “Fair enough. I accept your challenge.” Gregory took up his bow again as the judge announced the plan to the crowd and the royal spectators. Applause followed. Gregory took three arrows in his hand and fired them in quick succession, each hitting the gold circle, forming a ring of three arrowheads within it. “What’s your trick, then, Thomas?” the judge demanded. ​ Myrhiadh turned her back on them, inserted her thumb and forefinger into her mouth, and whistled. A nondescript, dark bay pony, about thirteen hands high, yanked his reins from the young teenage girl holding him at the edge of the field and trotted across the grass to Myrhiadh. “Leaving so soon?” Gregory taunted. “Not before I’ve had my shot. Patience, Mr. Ellis.” Hooking her bow over her shoulder and taking an arrow between her teeth, Myrhiadh sprang nimbly onto the pony’s back. He snorted and danced beneath her. “Easy, Aiko.” Myrhiadh tied the reins so that they could not fall, and then, with a squeeze of her legs, turned the pony and trotted back toward the girl at the edge of the field. Murmurs of surprise and speculation rippled through the crowd. “Myrhiadh, what are you doing?” the girl hissed, dismay in her dark brown eyes.